Africa Tech Summit (Americas) was launched to galvanize diaspora communities in major cities around the world and bring them back to Africa. The hope is that key influencial innovators can help accelerate the tech movement across the continent. From features in Forbes Magazine to leaders of political movements, this list features some of the biggest entrepreneurial influencers in the world. Kwame Anku is the CEO and Chairman of the Black Star Fund, an early stage innovation fund. Prior to the Black Star Fund, Kwame was the Co- Founder & Principal of the Black Angel Tech Fund, a pioneering fund that focused on capitalizing Black technology entrepreneurs. Recently named “One of the Top 25 Black Venture Capitalists to Watch in 2018” by Pitchbook, Kwame has worked extensively in business development and media marketing for over two decades. 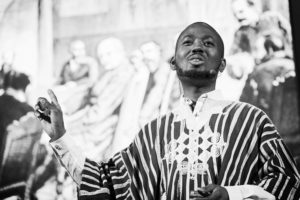 In September 2018, Kwame was selected to be one of only twenty-one recipients of the prestigious Aspen Ascend Fellowship from The Aspen Institute. Kwame entered into the tech industry after being personally recruited by the late legendary rock star Prince to develop his mobile app, overseeing business and development teams in Africa, Asia and the US. He later went on to serve as the National Director of Strategic Development for the Prince-inspired #YesWeCode initiative, where he developed corporate and media partnerships. Kwame now serves as a mentor for both the AT&T Aspire Accelerator and Founder Institute Sacramento. Kwame has appeared on numerous national television and radio programs including CNN, MSNBC, BBC Worldwide, SiriusXM, & National Public Radio. His work garnered two invitations to the Obama White House to share ideas and best practices with leaders from around the United States. Kwame has delivered powerful keynote addresses and been a featured speaker at events such as the Google For Entrepreneurs’ Black Wall Street Conference to the First-Ever Ghana Tech Summit in West Africa. Global Expansion Expert | Comedic Storyteller | TED Speaker founder of Kin, A network of Black/African people building solutions for the world’s hardest problems. Chike is the founder and lead executive of Startup52, NYC’s premier and award winning diversity-focused accelerator with a mission to increase the representation of founders from untapped communities in tech and startup entrepreneurship. He is also the executive producer and host of TECH:INColors, a new facebook live show that explores the intersection of tech, entrepreneurship, culture and inclusive diversity. Chike’s passion for diversity and untapped/under-tapped communities has led him to speak at several national conferences as well as at the White House, TEDx, Harvard, VC conferences, NY Governor Cuomo’s MWBE Forum, and recognized by NYC Mayor Bill De Blasio. Chike and Startup52 have have both been profiled in Fast Company, Forbes, Ebony, BizJournal, Black Enterprise, Entrepreneur, UrbanGeekz, and many others. Kamil is a true embodiment of “Thinking Globally and Acting Locally,”​ he’s lived, schooled, worked and/or visited 30+ countries on 5 continents. He generally considers himself a “global citizen”​ with a passion for Africa. Nailah Ellis-Brown is the CEO of Ellis Infinity Beverage Company, which she founded in 2008. Ellis Infinity is the manufacturer of Ellis Island Tea, an all natural, antioxidant-rich Jamaican sweet tea. Ellis Island Tea is a smooth, flavorful Jamaican blend, steeped in family tradition, brewed and bottled in Detroit. The crimson-colored iced tea can be found in quality-oriented upscale food markets and shops, including Whole Foods Markets, Sam’s Club, Kroger, Meijer, Avalon International Breads, etc. The Jamaican sweet tea can now be found in airport concessions across the country and can be found at Ellis Island and Liberty Island in the cafés and gift shops. Startup Institute provides immersive education for the innovation economy. We helpindividuals to develop the skills, mindset, and network to get jobs and thrive in high-growthcompanies. Mission is to unite young Ghanaian women from diverse backgrounds and disciplines to develop a gender specific professional toolkit to succeed in finance and technology related career fields. AffinitiVC is an emerging investment firm building a venture capital platform. The firm hasthree investment verticals: corporate venture advisory, primary fund of funds investmentsand direct co-investments. About Africa Tech Summit: The Africa Tech Summit is the world’s most exclusive event featuring Africa’s growing network of exponential tech influencers. The annual program brings together hundreds of entrepreneurs, investors, pioneers, and creatives under one roof to address the greatest exponential technologies launching across the continent and its future role as the world’s final tech frontier. The summit also serves to teach fundamentals of frontier tech investments, startup development and ecosystem building via exclusive workshop sessions with award winning experts. The program concludes with a high profile call to action VIP dinner with summit speakers and partners.